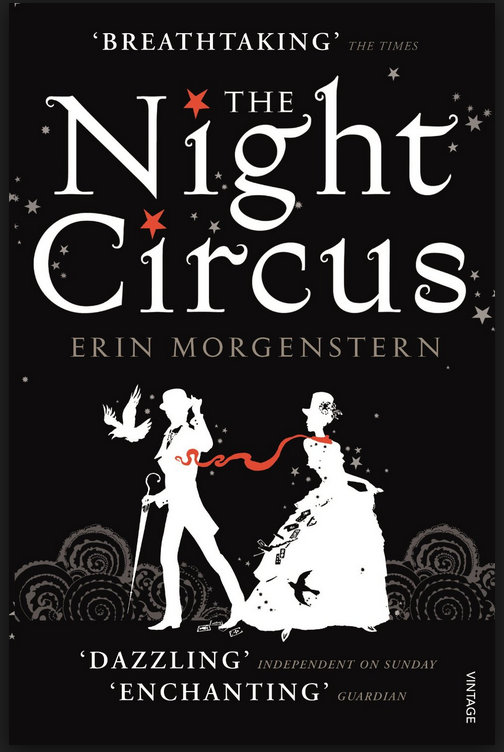 When Erin Morgenstern’s The Night Circus was chosen as the December Sword & Laser book pick, I was curious – I hadn’t heard anything about it before ordering my copy. I was expecting something different from the usual castles and wizards, and what I got was a fantastically unique world that didn’t disappoint. I often order used copies of books. Usually the physical aspects of the slightly musty books with mildly bent bindings aren’t worth noting, but when my “good” copy of The Night Circus arrived in the mail, it was clear that this book had been through it. And by “it” I mean something resembling a car wash. Coffee stains evident on the pages, the covers full of what one can only assume to be acid-induced pot marks, the binding worn through, a warp so bad that the hard-cover book has no hope of ever lying flat on a table again. And, for some reason, the battered exterior of this text only added to the charm of the story within. The Night Circus is the story of two young magicians trapped in a mysterious battle of unknown rules, who work to create a mystical circus that can only be visited at night. Although the plot and characters are fairly interesting (despite being rather predictable at times), what makes this book truly special is the atmosphere it creates. The sights, the sounds, the smells – it really does make you feel as though you are a spectator at a classy and mysterious circus. The stories of the characters are woven together to create a wonderful sense of the peculiar life of the performers, and of the fans who become obsessed with tracking the circus’s every move. I wouldn’t say that the plot or characters of this story are highly original – indeed, the star-crossed lovers scenario is nothing new to the works of fiction, and the outcome of the story could have been guessed from close to the start of the book. Indeed, the romantic interactions would have been nauseatingly trite if the rest of the story wasn’t so superbly constructed around it. Happily, the book was about so much more than one romance. I was never really surprised by any of the “plot twists,” but, then, everything that happened in the story seemed to flow together quite nicely. Well, perhaps not one or two of the events leading to the conclusion, but I think the story had earned my suspension of disbelief by that point, so, I’m willing to go with it. This book is definitely one that epitomizes the idea that “it’s not about the destination, it’s about the journey.” I wouldn’t say that this book lacks plot – there is definitely enough of a story going on to keep the reader interested – but the real fun of this book is exploring the circus and all of the fantastic people who inhabit it. The prose has a lovely lilting quality to it; I think I fell in love with this book after only a few pages because of it. Even the style of the printed text adds extra flourishes that contribute to the feel of the story. It was the sort of book I didn’t want to put down, and itched to pick back up as quickly as possible. I suppose I could understand how someone might not be excited be the easy-going plot or the subtle characters, but I fell under the spell of this book quickly and completely. It really was a magical book and one I highly recommend. I agree this book is all about the fantastic atmosphere, and the details of the circus. The plot was nothing much, and from reading a bit about the author it appears that the plot came second, when her editors pushed her to revise the original manuscript to have more plot. That makes complete sense to me having read it. But nonetheless, like you, I highly recommend it.